← Excel columns and rows too small? 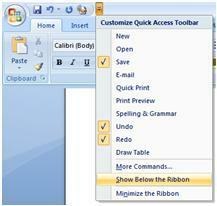 By default, the Quick Access Toolbar is within the program’s Title Bar (as you’ll see in the screenshot below). Changing its position is as simple as clicking on the little arrow on the right hand side and choosing “Show Below the Ribbon”. One of my next posts will be on customising the toolbar, so why not Follow my blog now ? Posted on March 26, 2015, in Tips and tagged excel, microsoft, MS, Office, Powerpoint, Quick Access Toolbar, ribbon, Toolbar, word. Bookmark the permalink. Leave a comment.